WHEN WE RISE: Celebrating Forgotten Hero Tommy Gene Brown "The Waco Bride" - "Long Live The Queens!" A well-planned raid early Sunday morning broke up a statewide “homosexual convention” while a mock wedding was in progress, police reported Monday. Detective Capt. Wiley Stem said 63 men, mostly ranging in ages from 24 to 33 were arrested in the raid of a two-room private residence in South Waco. Fifteen detectives, a Texas Ranger, and a district attorney working with information furnished by undercover agents, closed in on the small house as the “bride” and “groom” were going through the mock ceremony before 60 invited guests. Police said some of the “guests” had come from as far away as New York, Virginia and California. Other “guests” were registered from Dallas, Fort Worth, Austin, Houston, Fort Hood, and Connally Air Force Base just north of Waco. Police said all had received “invitations” to the affair. – The Waco Citizen. The Associated Press put the number arrested at 64. Some men reportedly chanted “Long live the queens!” on the way to jail.. One guest from Ft. Worth was charged with possession of marijuana, and others were charged with vagrancy — they posted $25 bonds (that’s about $220 in today’s money) and were released. The Waco Citizen, a twice-weekly neighborhood paper named names and since it was 1953 many of those who attended lives were ruined. And what happened to Tommy Gene Brown, the “Waco Bride”? As for Tommy Gene, she held her head up high and went on to live a productive, colorful life.In 1959, Tommy Gene and her lover Fred–whom she met in Dallas–left Texas for San Francisco where they lived happily forever after. Fred worked and Tommy Gene kept house. That’s the way Fred and Tommy Gene wanted it. In San Francisco, Tommy Gene became involved in one of America’s first gay organizations, the Society for Individual Rights (SIR). Here she helped with the dances and costumes for gay productions of “The Boy Friend,” “Pal Joey,” “Hello, Dolly!” and “The Wizard of Oz.” As a child, Tommy Gene’s favorite fantasy was to be like Shirley Temple, so friends at SIR called her Shirley, and the name stuck. Under the Imperial Court System, “Shirley” won the title of “Empress III Shirley,” after which she refused to appear in public without drag. 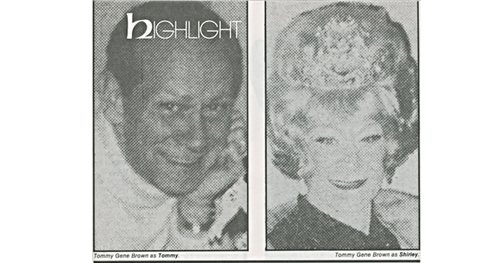 She passed away in 1989.
drag queen forgotten gay history Gay History Texas The Imperial Court The Waco Bride Waco Texas WHEN WE RISE: Celebrating Forgotten Hero Tommy Gene Brown "The Waco Bride" - Long Live The Queens!